When you go on vacation it can be difficult – even impossible – to maintain your fitness levels. 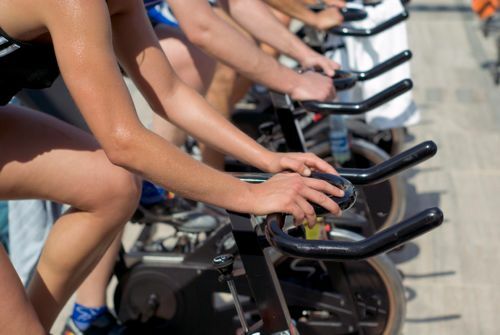 After all it is a time for relaxing and chilling out with your family and friends, so your cycling training program tends to take a back seat. Finding the time without compromising your loved ones can be a challenge but it can also be fun. So I have devised a training program to make sure you don’t waste all the months of hard work that you have put in while on vacation. When you are on vacation you can’t follow your regular training program. You can’t train on your normal bike or ride your regular routes. Instead focus on the possibilities and not the limitations. Cycling on vacation can be an excellent way of discovering new places: take in the sights and sounds of your new surroundings while simultaneously maintaining your fitness. Read more about being proactive. 2) Cut down on the number of training days. In fact, reducing your total training time may well be good for you. The optimal number of training days is three because you will then be able to tackle tough intervals in every session. If you train fewer times per week, you will not get enough stimuli for your aerobic system. 3) Decrease the length of training sessions. When you go for shorter rides, it becomes easier to stay focused and concentrate. Consequently you will get more quality into your training and fewer junk miles. The real secret to succeeding with a dramatically reduced training amount is highly effective interval training. By doing intervals, you will be able to get a lot of training with an intensity close to VO2 max. And that will largely compensate for the reduced training volume. 5) Use the 80/20 principle. Focus on the things that improve your performance and leave the time-consuming tasks for later. So you should mainly focus on high quality training sessions and (for a while) forget about fine tuning and polishing your bike and shaving your legs etc. To sum up: spend the time you are away from your travelling partners wisely. I have boiled these tips down to a ready-to-use training program for you. Since this program is extremely time effective, I have called it The Magic 2Hr/Week Cycling Training Program. Have a great time on your vacation but don’t forget to find the time for my free Magic 2 Hour Cycling Training Program. I hope you enjoy it and I wish all of you the best of luck with it. This is brilliant stuff and very good timing. Leaving for vacation tomorrow. Thank you, Jesper. Thanks! Pretty close to my holiday program. I also did couple of cruises with “boatwithpedals” in Italian beach resort. My son was the captain of the ship and I was the one who got tired first..
30 x 40sec with 20 sec rest? That seems almost impossible – that,’s 30 min of 40 sec all out intervals separated by 20 sec rest – I don’t see how you could keep power high enough through the whole 30 min. I’m a pretty good Cat 3 racer, and I’m seeing huge power drop offs after 12 min…enough of a drop that I’m no longer hitting VO2. 30 x 40sec max effort IS impossible. Tabata’s group managed 7-8 sets of 20 on -10 off. That’s for world champion speedskaters. The point of the intevals is building your body. If you can only do 10x 30 on 30 off. So be it. Your body will respond and over time. The number of intervals you can do will grow.